GRIZZLOR's website is GRIZZLORDESTROYS.COM, and that could not be a more apt URL. 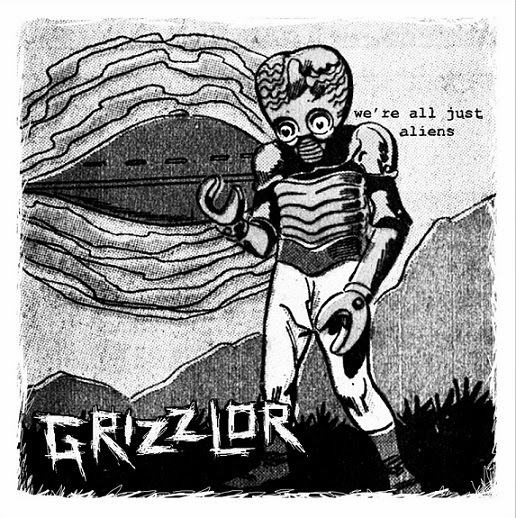 GRIZZLOR has a fierce and blown out noise rock sound. Disjointed and off kilter, "Socially Awkward" is extremely abrasive and has a super solid back beat. The only vocals that could go with this are explosive spit drenched shouts, which is precisely what you get with GRIZZLOR. "Smoking Kills" tricks you into thinking this band might mellow out a bit, and then answers your presumption with guitar blasts up in your face. "Die Alone" is a riff heavy tune with a whole bunch of attitude. This could be the closest thing that resembles a single from this EP. I think if there would be one word to describe this song and perhaps EP so far it would be "mean". This band and these songs are really mean. "Drinking Blows" rocks hard too, and has a sort of angrier Ty Segall thing going on, which definitely carries on into "Boring Guy". Off beat repetitive riffs take center focus over the solid beat. The title track has this little spice of surf rock tinging it, with some more prog elements too. All and all this is a raucous and high energy EP, a good time waiting for anyone to find it. Favorite local album, albeit by a thin margin. Great live show.